As a millennial who is heavily involved in social media, personally and professionally, I wanted to take a deep dive on one specific social media platform that continues to change the world: Facebook. My timing could not be more perfect as Frontline has conducted a two-part documentary series on PBS called The Facebook Dilemma. The two-part documentary series shows original interviews and rare footage of early warnings about Facebook’s impact on privacy and democracy in the U.S. as well its response to charges of disrupting American politics. The Facebook Dilemma can be seen here in its entirety. I would recommend watching The Facebook Dilemma as it peeks back into the history of Facebook, the early warning signs about data privacy that Zuckerberg did not address during their IPO, propaganda for the Russian government and data leaks regarding the 2016 U.S. Presidential Election. There are a few noteworthy quotes that were mentioned in The Facebook Dilemma that stood out to me. Some were from Zuckerberg himself and others from Facebook executives — all of which are now ironic to me. It was right before Facebook’s IPO in March of 2012 that Zuckerberg and team knew that the personal data it had on its users was the advantage leadership used to sway investors and persuade how great of a business and profit Facebook was. Cheryl Sandburg, Facebook’s Chief Operating Officer, would begin to experiment with user’s personal data. Multiple partnerships formed with data broker companies. Third parties, including games and apps for the platform, to begin capturing user data. The FDC stepped in and stated that Facebook did not make it clear to consumers the extent to how their data was being used. Even though the warning was shed on Zuckerberg, he and his team were purely concerned on revenue and user growth – now he must answer to the demanding questions of how Facebook will continue to operate while being able to keep user’s personal information secure. At present day, ahead of the 2018 Midterms — we ask to ourselves – is Facebook ready? Facebook’s dream was to unite us, but did it divide us? 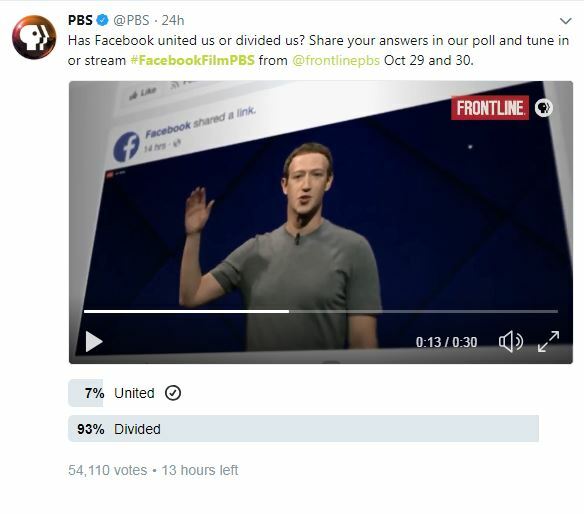 I took to Twitter with #FacebookFilmPBS and the result to a PBS poll was shocking. Of 54,110 votes, 93% of the people voted that Facebook divides us. I was among the 7% that said it unites us. From Facebook’s failure to protect millions of users’ data, to the proliferation of fake news and disinformation, mounting crises have raised the question: Is Facebook more harmful than helpful? Leave Breadcrumbs, I’ll Find My Way Back! The Case of the Upside-Down Label: Good or Bad UX?